[Our PrimeMinister Sh. Narender Modi ji in Pariksha Par Charcha said that Tamil is a beautiful language and its older than Sanskrit. Modi ji unknowingly quoted this as a mistake.Sanskrit is the mother of all languages. I am reproducing this research paper to prove this fact. This paper was presented in First International Sanskrit conference held in 1975 in Delhi by its author P. Nilkantha Sharma, French Institute of Indology Pondicherry. This Abridged version is reproduced by Dr. Vivek Arya from PROCEEDINGS OF THE 1ST INTERNATIONAL SANSKRIT CONFERENCE VOL-3 PT-2, 1975 available online on Archives]. It has been admitted that Sanskrit is one of the most ancient languages of the world. The language was once spoken by all. The Vedas, the Ramayana, and Mahabharata are most famous Sanskrit texts. Few people considers Sanskrit as a dead language. A language can be considered dead only if it ceases to exercise any influence on the people as well as on the languages of the land. Viewed from this angle, Sanskrit can never be considered dead. It continues to live in this land by invigorating and enriching not only the various languages in India, but also those in the Far east and serves as the sole link, for bringing together the different languages of India, thus proving the unity and integrity of all the people in India. It is still being used for religious and philosophical purposes. That Sanskrit, the Divine language, is the mother of all Indian languages is quite clear to any scholar of impartial views. Among the Dravidian languages Tamil is older than all of them, its initial stages going as far back as several centuries before Christ. Even before the time when the Ramayana was composed, and when the art of writing was unknown to man, there existed in this land the great Vedas handed down from generation to generation, orally and hence called “Shruti”. And writing started with Sanskrit. Though from very early times up to the present day, orthodox Hinduism of the Vedas has been an eternal factor in the Sanskrit influence of Tamil, it has to be admitted that Buddhists and Jains had a considerable part in the improvement and growth of Tamil not only in the early period but also at the beginning of the middle ages. The major old works in Tamil were their productions and they did not hesitate to incorporate their dogmas and theories into them. All of them being proficient in Sanskrit, they left no stone unturned in imparting Sanskrit influence to Tamil. Anyway Tamil is surely indebted to them and that too in no small measure. In later times, Buddhism and Jainism had to give way to Saivism and Vaisnavism which had their renaissance from the songs of Tevaram and Divyaprabandham of the Saivaite and Vaisnavaite saints. Moreover with various tantric cults and Puranas coming to prominence at this time on one side and the great philosophers like Sankara, Ramanuja and Madhva preaching their philosophical doctrines on the other, Sanskrit influence in Tamil became all the more widespread and it has continued to be so up to the present day. There are two lexicons in Tamil which are considered to be pretty old. They are Cintar Tivakaram and Pinkala Nikantu. If one happens to go through them, he will find that Sanskrit words either in their original forms or changed and Tamilised forms according to the rules laid down by Tolkappiyar, occupy a greater portion of the texts. In their enumeration of “ornaments of sense” and the eight-fold angas of Yoga both of them follow Natyashastra and Patajnjala Yogasutra respectively, not to speak of other minor items. Now ‘nikantu‘ is the Tamilised form of the Sanskrit word ‘nighantu’ or ‘nighanta‘. Originally it was the name of a Vedic glossary included by Yaska in his Nirukta. But subsequently it came to mean any collection of words or vocabulary. In Tolkappiyam II, 397, the author classifies words into four kinds as iyaRcol, tiricol, ticaiccol and vatacol. lyaRcol is indigenous word and vatacol is Sanskrit word. Tolkappiyar, Sanskrit words having been inseparably mixed up in Tamil. So, there can be no denial that Tamil is very ancient but, its development took place under Sanskrit influence. Sanskrit influence in Tolkalppiyam and TirukkuRal have been proved by scholars like Vaiyapuri Pillai, Ramachandra Diksithar, Krishnaswami lyengar and others. In AkanaNuRu PuRanaNuRu and others, the occurrence of words like yupum (yupa), avi (havis), avuti (ahuti), tun (sthuna), amarar (amara),vetam (vedu), mutti (tretagni) and tavam (tapas) clearly shows that even Vedic Sanskrit did have some sort of influence in those times. Words relating to the ordinary social life, pantam (bhanda), ulakam (loka), pokam (bhoga), amiLtu (amrta) and mantilam (mandala) and the like were also contributed by them. There is a work called Acarakkovai, probably the last one of the Sangam anthologies. Its author was Mulliyar of Vankayattur. The work deals with the rules of conduct, customs and daily observances of the Hindus. The author himself avows in ‘ciRappuppayiram’ that he has based his work on materials drawn from various dharma Sastras or smritis. Apastamba’s Grihya and Dharma-sutras, DharmaSastras of Bhaudhayana, Gautama, Visnu and Vasistha, the Smrtis of Manu, Yajnavalkya, Parasara, Likhita and Harita, Samhitas of Usanas and Visnu Purana, some having been literally translated. Both these are twin epics, the story of the latter being a continuation of that of the former. Both contain thirty cantos each, each canto bearing the name of ‘Katai‘ which is a Tamil form of the Sanskrit word gatha. In Cilappatikaram the whole of the third canto is based on the NatyaSastra of Bharata. A story from Pancatantra is reproduced in canto 15, 54-74. The knowledge of astronomy and astrology displayed in cantos 23 and 26 is noteworthy. The duties of people belonging to different communities, moral rules of diverse nature, the theories and tenets of various religious sects and many other kindred topics have found place in this work as a result of Sanskrit influence. In Manimekalai, canto 27 deals with Pramanwada, Ajivakavada, Sankhyavada, Saivavada, Nikhandavada, Bhutavada, Mantravada,Vedavada, Vaiseikavada and Vaisnavavada. Canto 29 describes the various aspects of anumana, hetvabhasas, drstantas of sadharmya and vaidharmya nature and drstantabhasas, all of which pertain to Sanskrit logic. As in the entire field of the Indian languages, so even in Tamil, excepting those works which are of a strictly classical nature and possess a purely literary value, all others concerning arts and sciences, like astronomy, astrology, music, medicine etc. are based only on the respective ancient treatises in Sanskrit. Even the Siddha system of medicine prevalent in the Tamil county is but an offshoot of Ayurveda following the works of Charaka, Shusruta and others. It is no exaggeration to say that the Sanskrit influence rose to the highest degree in Tirumantiram. Whatever is said about Tirumular, the author, by way of tradition, none can deny that he was a vast ocean of Sanskrit learning. He speaks about the four Vedas, the six Vedangas and the twenty-eight Agamas, with utmost regard, Verses 62 and 63 say that he obtained from his Guru, Nandi, nine among the 28 Agamas. In verses 73, 77 and 81, he says that he had been ordained by his Guru to render the Agamas and the Vedas in beautiful Tamil. The work contains a little above 3000 verses divided into nine Tantras. The reconciliation of Tamil grammar with that of Sanskrit attempted in Viraco Liyam, Pirayokavivekam and Ilakkanakkottu by their authors is another proof of how far Tamil grammar is indebted to Sanskrit. Moreover Shivanana Svamikal, has expressly stated that Tamil learning cannot be complete for those who have not learnt Sanskrit. Featured image courtesy: britannica.com and Scroll. Why Would the West Learn Sanskrit? Startling Revelations! Assamese Woman Weaves 500 Verses of Bhagavat Gita in Sanskrit in Cloth! 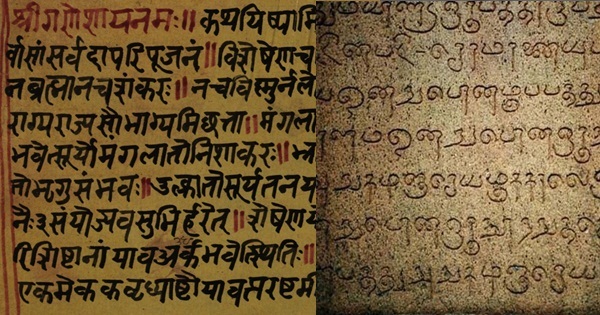 Mattur: Sanskrit Speaking Village Where Ancient Meets Modern Uma Mohan: Musical Mantras in Sanskrit from the Vedas and Scriptures Vedic Hindu Roots in Burma; Sanskrit and Pali Were the Court Languages Manu’s Dharma Sastra; Manu Influence in Egypt, Sumeria, Greece, etc.